Ok so we are here! 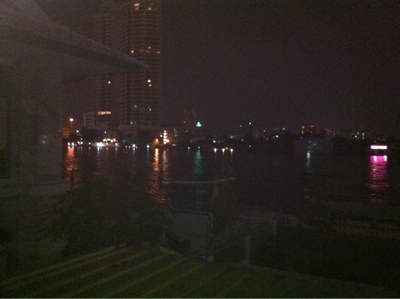 We have a river view room and although it is dark the river looks very swollen. No doubt we'll get a better idea tomorrow. The temporary wall they are building around the hotel (2 foot high) is a little disconcerting but we are on the second floor and very stuffed after the 9 hour flight so I'm sure we'll sleep well. After a Singa and some room service of course!